In his address at the 2014 St. John Fisher Diner in Kingston, Ont.—hosted annually by Convivium editor-in-chief Father Raymond J. de Souza as a chaplain of Queen's University—Cardinal Archbishop Timothy Dolan of New York defines the soul, mind and heart of the church. Archbishop Fulton Sheen taught us not to presume anything. He told the story once about counselling a woman who was having marriage difficulties. She said, "My husband is a louse. He's awful. If you could come by and see him, I think he'd get better." Monsignor Sheen, as he was at the time, stopped into the apartment off Lexington and 38th in New York. He knocks at the door, she opens up and, sure enough, there's the husband lying on the couch, unshaven — this is about 11 in the morning — looking terrible, reading the newspaper, and he doesn't even get up. He says, "Oh, hi, Monsignor Sheen. Tell me, what causes gout?" Monsignor Sheen says, "Hahaha, I got this guy. This is a great opening." He said, "I'll tell you what causes gout, young man: staying out too late, drinking too much, chasing women, an unruly, undisciplined life. That's what causes gout. Well, why do you ask?" He said, "Well, I'm just reading here in the paper that Pope Pius XI has gout." I don't like to jump to conclusions, folks, but I've already jumped to one this evening and that is I feel very much at home, and that is due to your extraordinarily warm welcome, so thank you very much. 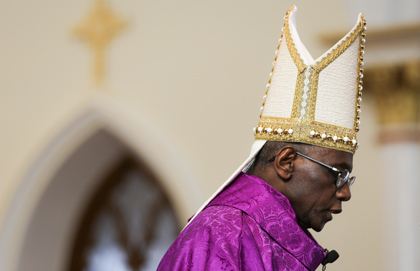 It was about five years ago that I got the call from the Papal Nuncio, at the time Archbishop Pietro Sambi. He said, "The Holy Father, Pope Benedict, wants you to go to New York." I said, "Well, Your Excellency, I'm very honoured, I'm very grateful, but I don't think I'm up to it. I don't think I have the competency and skill. I don't think I'm worthy to go." And he said, "We know all that. We didn't ask you that. We just asked you to go, so please do." I'm glad I did. As I look out tonight, what makes me particularly happy is to be in the company of brother archbishops — Archbishop O'Brien and Archbishop Prendergast — to be in the company of brother priests and deacons, and religious sisters, particularly. I'm so proud of our Sisters of Life in the Archdiocese, our students and those in the Apostolate of Catholic Community Outreach, our benefactors. Brothers and sisters in Christ who are here this evening, just to be in your company is a real inspiration — to see people who take your faith seriously, to see people who want to witness and give testimony to that faith in one of the tougher climates that we've got today, namely the campus of the secular university. To see you do that and to do it so splendidly, that's an inspiration to me. One happiness that I have when I get to go around speaking is to see, now, functioning and exercising as such effective priests, the men that I was privileged to have in the seminary when I was rector of the North American College in Rome, and there's three of them here tonight: Father Bryan Stitt, who's the wonderful parish priest and the Director of Vocations in the Diocese of Ogdensburg. Father Mark Steffl, who's in graduate work at Canon Law in Ottawa, is here and, of course, our own beloved Father Raymond de Souza, who does such a stellar job as pastor on Wolfe Island, in communications nationally, and internationally for that matter, and for the exemplary work that he does as Chaplain to the Newman Centre on campus. You three priests, I'm so very proud of you, and you make it all worthwhile. So thank you, Father Mark and Father Bryan and Father Raymond. Thank you for making me, your old director, so proud. Thank you. I just got back from Rome yesterday, had a big benefit last night at the Waldorf Astoria in New York to raise money for Catholic charities. We made $2.5 million. Not bad, huh? Tonight I'm honoured to be here. I'm back tomorrow night in New York. We have a big fundraiser for St. Patrick's Cathedral because we're doing repair, restoration and renewal in St. Patrick's. St. Patrick's is a real icon, as you know. When I got there, I had a luncheon for the ecumenical clergy, the clergy from around the city: Jewish, Orthodox, Christian, they all came in, and the Methodist pastor, who is pastor of Christ Church United Methodist on Park Avenue, he was one of those. He had to give me a toast and he said, "Archbishop Dolan, we welcome you to New York," but he said, "I am very angry at you and I'm very jealous of you." I said, "Uh-oh, what's this about? We're off on the wrong foot." He said, "I am pastor of Christ Church. We had a benefactor that was going to come give me $3 million. He got in the cab at Penn Station and he said to the cabbie, 'Take me to Christ Church,' and the cabbie took him to St. Patrick's Cathedral. The benefactor said, 'Listen, cabbie, I asked you to take me to Christ Church. This is St. Patrick's,' and the cabbie turned around and said, 'Listen, buster, I don't know anything about religion. All I know, here in New York, this is where Christ lives.'" Jesus Christ lives at the Newman Centre on the campus here at Queen's University in Kingston, and that's so evident to me even though I've only been here about eight hours, and I thank you all for making that possible. Now, as Father Raymond said, what I thought I'd do this evening is try to speak for about 25 minutes or so on the last three popes, because I think these giants, John Paul II, Benedict XVI and now our beloved Pope Francis, can teach us a great deal and especially bring home some tried-and-true lessons for our campus life here and the Catholic students that are trying their best to live life as faithful Catholic disciples on campus. What I thought I'd do, everybody, is speak in terms of soul, mind and heart. Soul, mind and heart. I'm going to propose to you the Blessed, soon-to-be Saint, John Paul II teaches a lot about the soul, Benedict XVI teaches us a lot about the mind, and Pope Francis teaches us a lot about the heart. I've used the vocabulary that Father Raymond suggested. John Paul II teaches us a lot about courage that comes from his soul, Benedict teaches us a lot about clarity that comes from an extraordinarily sharp mind, and Francis teaches us a lot about charity that comes from a burning pastoral heart. We got courage, we got clarity, we got charity, we got soul, mind and heart. Hear me out here and see if I make sense. Let's start with our Blessed, soon-to-be Saint, John Paul II. I propose to you that John Paul II, his tremendous contribution to the life of the Church was the restoration of the soul, the primacy of the spiritual in the life of the Church. When he visited the United States in 1979, when he went to the White House, then president Jimmy Carter introduced him as the soul of the world. Billy Graham said of John Paul II, "A providential prescription for humanity's exhausted soul." Rabbi Gilbert Rosenthal, a good friend of mine, when he and a group of Jewish leaders went to see John Paul just months before he died, somebody said, "This man, his body is gone." And Rabbi Rosenthal said, "We're not going to see his body. We're going to look at his soul." John Paul II, folks, set as his mission the recovery of the primacy of the spiritual. "Seek ye first the Kingdom of God," as Jesus tells us in the Gospel. "Take care of the soul, put the spiritual life first," John Paul would say to us, "and everything else is going to be in its proper place." He himself, John Paul II, bordered on the mystical. You know what a mystic is? A mystic is one rare person indeed who has periodic unity here on Earth with God, the kind of unity that we all look forward to in Heaven. John Paul II was a mystic. You could go in at about five minutes to seven, knowing that he had been at his prie-dieu for an hour. You would see him literally hypnotized, locked in prayer on his knees in his prie-dieu. If you were blessed to be up close, you would hear him groan, you would hear him sigh. Periodically you would see tears. This was a man who was in touch with the Divine. This was a man whose soul was burning with God's grace, who was literally a temple of the Holy Spirit. This was the pope, as George Will said, "who knew how to pope," because of his strong interior spiritual life, because his soul was aflame with the Holy Spirit. He would describe September 1, 1939, only 19 years old, as he looked up to see the Luftwaffe, the German air force, come in and take over Poland. He would see his friends disappear in the middle of the night. He'd seen the brother seminarians with whom he would serve in morning Mass, the next morning he'd be the only one there because the other seminarians had been arrested. Hit by a truck filled with Nazi soldiers as he was coming home late at night from work in the chemical factory, he was left for dead. Then, when the war ended in 1945, Poland would lose again as the jackboots of Stalin and communism came in. No wonder Karol Wojtyla would learn first-hand what the Psalmist says, "Only in God is my soul at rest." No wonder Karol Wojtyla would know first-hand the saying of Jesus: "Don't be afraid of those who can kill the body. Fear only those who can damage the soul." No wonder, folks, his first words on October 16, 1979, were simply, "Be not afraid." Be not afraid. To restore the exhausted interior life of the Church's soul became the major goal of the pontificate that would last almost 27 years. How did he do it? By placing Jesus Christ at the centre. Jesus Christ would become the centre. As he would say, "Jesus Christ is the answer posed by the question asked by every single human life." Placing Jesus Christ at the middle, Jesus Christ in the Scriptures, Jesus Christ in prayer, Jesus Christ in the Eucharist, Jesus Christ in the Sacraments, Jesus Christ in the arms of His mother, Jesus Christ in the poor. As AndrÃ© Frossard said the year after [John Paul II] was elected, when he wrote that masterful biography, "The world is saying we have the pope from Poland. We don't. We have the pope from Palestine. What this man is trying to do is return us to the Year 30 AD, when the whole Church is walking along the shore of the sea of Galilee, listening, learning, loving and serving Jesus Christ." Now it all came to a head, this restoration of the Church's soul, not long after he was elected pope in June of 1979 in what has been called "the nine days that changed the world." Henry Kissinger, in speaking to St. Joseph's Seminary in Dunwoodie, New York, the seminary for the Archdiocese in New York, just a couple of months ago, said that John Paul II did for Poland in June of 1979 what Winston Churchill did for England during the Second World War: restored her soul. He galvanized the nation, and that word was born, the word that we call "solidarity." Nine days that changed the world. Gorbachev would say it was the beginning of the end, meaning the end of the communist regime, the end of the Iron Curtain, when John Paul returned to his beloved Poland. What do we mean by "solidarity"? When John Paul was there and two thirds of the nation lined the roads to see him pass, John Paul never once used the word communism. John Paul never once spoke about Russia. John Paul never once referred to the hundreds of thousands of Russian bayonets that were lined up ready to crush whatever rebellion might take place because of his visit. No. He was simply there and he simply, powerfully, dramatically reminded people of something that became a household word, namely "solidarity," so that all of Poland all of a sudden lifted up their heads and said, "We're not by ourselves. We're not alone.We're not a number. We're not a cog in a wheel. We have a name. We have a heritage. We have a culture. We have a destiny. We're not an animal. We're not a mere machine. We're not collectives like the communists think we are, but we are communities. We're not just a hollow body. We have a soul. We have faith." Remember the closing Mass? A million and a half people in Warsaw Square, and as John Paul begins to speak, it just started, in one little corner of the square, do you remember? The crowd gradually, gradually picked it up. It became a chant that echoed through the square, that echoed through Warsaw, that echoed through Poland, that echoed through Eastern and Central Europe, that echoed through the world. It became a chant, just three words in Polish. It wasn't a chant "Russians go home." It wasn't a chant "Down with communism." Can you remember what the chant was? A million and a half people slowly, slowly, slowly, before they're all on their feet, shouting it out: "We want God. We want God." A million and a half people. "We want God." It went on for 30 seconds, a minute, a minute and a half, two minutes. John Paul simply stood and watched. His master of ceremonies came over and said, "Holy Father, perhaps you should tell the crowd to be quiet so you can go on with your sermon," and he smiled and he said, "Are you kidding? This is what I came for, all right?" A million and a half people: "We want God." Solidarity is born. The soul is restored. When the archives in the KGB were opened after the fall of the Berlin Wall, the KGB commander from Warsaw in a telegram that evening sent back to headquarters in Moscow said: "It's over." It's over, as a million and a half Poles shouted: "We want God." This restoration of the spirit, of the interior life was even further enhanced as we watched John Paul II die in front of our eyes, as the world watched him die, and as weakness and frailty took over a man that we could remember to be hardy and to be athletic, to be so strong and vigorous. When I was in Milwaukee, a young married couple came up to me after morning Mass at St. John the Evangelist Cathedral and they were on their way to Rome. They had just been married the night before. I said, "Hey, you got your marriage licence? I'll call over and see if you can meet Pope John Paul II after the Wednesday audience." She was ecstatic; he wasn't that much. He said, "Well, I was kind of hoping you could help us with restaurants." And I said, "Hey, I knew that, too, all right, but let's make it work." When they came back two weeks later, it was he who was ecstatic. He said that seeing John Paul II was tremendous. I said, "Tell me what moved you at the audience," expecting maybe that he'd speak about the crowds or John Paul's linguistic abilities, but he said, "I'll tell you what moved me. We had great seats because of you. We could look right at the Pope. When he started talking, after about 20 seconds, I saw John Paul reach into his pocket and take out his handkerchief and wipe his mouth because he was drooling." John Paul was drooling. The Pope was drooling. The Vicar of Christ was drooling. And he said, "I found that to be amazingly moving, that in weakness, God's grace and strength was so powerful." John Paul, through his own suffering, the assassination attempt — remember? — the Parkinson's, the cancer, the broken leg, the broken hip, the botched surgeries, John Paul's suffering helped restore the soul of the Church. What can we learn here from John Paul's restoration of the soul? What can we learn here from the courage that John Paul talks about? Our young people, and they're here this evening, do you ever need courage now to lead a faithful Catholic life? I've heard Father Raymond say to you, "On any campus these days, you don't have to be embarrassed about doing debauchery or misbehaving on campus. You don't have to be embarrassed about that at all. That's acceptable. You do have to hide and sometimes you do have to sneak around to practise your faith, because it's not chic, it's not popular." We got a man like John Paul II who restores the soul of the Church, who reminds us "be not afraid," who reminds us about the power of solidarity, who reminds us that God's grace is strongest in our weakness. That's what John Paul can teach us. Let's go on to Benedict XVI, can we? As John Paul touched the soul, Benedict XVI touched the mind. What Benedict XVI did in his brilliant papacy is remind us again of one of the fundamental pieces, of ingredients of the Catholic recipe of 2,000 years, namely that reason and faith are not enemies at all, folks. Reason and faith are allies. This was the ancient insight of the fathers, particularly of Saint Anselm. This is the great insight of Blessed John Henry Newman. Reason and faith are allies. Reason is the greatest natural gift God gives us. Faith is the greatest supernatural gift He gives us. Strange would be the god who would have those two supreme gifts at odds. Now, this is extraordinarily timely, everybody. In a world of the new atheism, where a secular culture on steroids attempts to reduce belief to a private hobby at best, or some silly oppressive superstition at worst, Benedict so beautifully, so poetically, so masterfully reminded us that reason itself, the human mind, shows us the truth and points to God. When reason is in partnership with revelation and faith, this becomes liberating, this becomes affirming of all that is good and true and beautiful in the human project. He reminds us as well that the Church is the engine of genuine human progress, and the Church's rich intellectual tradition is hardly some museum piece but is as timely as they come. Benedict would revive the intellectual wattage of the Church. Think about some of the ways he did this. Let's look at what we call "affirmative orthodoxy," that Benedict said the Church is always about a ringing, resounding "yes" to everything that is good and decent, truly beautiful and noble in the human project, that contrary to his own caricature from which he suffers and contrary to the stereotype given the Church. The Catholic Church has been in the business of affirmation in saying "yes" to everything that is good, liberating, true, noble and beautiful in the human project. The Church only says "no" to something that negates everything that is good and noble in the human project. I don't know about you, but as Benedict said, where he comes from, two no's make a yes. When the Church says "no" to another no, she's still saying "yes." A second way would be in what your own Father Raymond has described as a September legacy in that pointed article he did in that splendid publication Convivium. In those four talks in Regensburg and Paris and London and the Bundestag, in an extraordinarily poetic way, and I would call it poetic, [Benedict] would speak about the intellectual treasures of the Church. It was from these talks that things such as his interior ecology come from. Get this, listen to this, and how powerful it is. Benedict XVI says in one of these September talks — in fact he was at the Bundestag — he said, "We all today know that we need to protect the environment. We all know that God has implanted in the environment, in Creation, a logic, a coherence, a beauty, a balance, a choreography, and that to tamper with that, to ruin the environment, is tragic. It's toxic." At that stage, the Green Party stood up and gave him a standing ovation, and he kind of looked at them and smiled and said, "Yeah? Well, listen to where I'm going with this one, all right?" Because he then said, "Just as there is a logic and a coherence, a law that must be obeyed in the exterior environment, guess what? There's also one in the interior ecology." The way God has made us as a human being points to a law, a logic, a coordination, a choreography, a symphony that is deep within the human person, giving us the law that must be respected, or else we turn into a Love Canal or a Three Mile Island filled with toxins and poisons within, just as we dread in the exterior world. Benedict would teach us in his September legacy to avoid the two extremes. Do you know what the two extremes are? Reason without faith, which becomes the dictatorship of relativism. It's anything goes and the only guiding principle is because I want to do it, when I want to do it, how I want to do it, with whom I want to do it, wherever I want to do it. That's the only absolute in the world. There is reason without faith, and there is faith without reason that becomes the shallow, superstitious fideism that will not hold up to the laudable scrutiny of the interior world. Benedict would point, using the words of Blessed John Henry Newman, to this via media, this middle way where faith and reason are blended in a Catholic wisdom that has sustained two millennia of culture, poetry, literature, science, universities and education. This is the Benedict XVI that took shock paddles to the mind, to the brains of the Church, and allowed us to hold our head high that this man, professor, teacher par excellence, could once again restore the intellectual credibility of the Church. The lesson of Benedict XVI, the restoration of the mind, this clarity, this clarity with which he speaks, the lesson for this campus and for you, blessed students on it, is magnificent. It is that we have nothing to fear of the truth, and the truth will set us free, as Jesus Himself said, and that when we take our studies seriously, when we take science seriously, when we take history and literature, when we take all of this, we are part of God's Creation, and we learn of God, we learn of the Creator as we learn of His Creation. Benedict XVI and reason. Finally, our beloved Pope Francis. It was a year ago, wasn't it, that Benedict XVI left. I'll never forget it. The helicopter left and he went out to Castel Gandolfo. I remember being at what we call the congregation, which was almost two weeks of meetings before the actual conclave started in the Sistine Chapel. I remember that on the first morning, we had a Franciscan preacher. Every morning we had about a 10-minute spiritual talk to the cardinals, and I remember the first morning, the Franciscan just looked out at us at the College of Cardinals and he said, "Your Eminences, one of you is going to be the next pope. The Holy Spirit has already chosen who that will be. Your job is to find out who the Holy Spirit has chosen." Not a bad description of the process, was it? I can see that's true now, the more that I come to know and love and respect Pope Francis. When he was asked what name he would choose, he said Francis. Right away, he said, "of Assisi, not Xavier." Francis Xavier, of course, is the great Jesuit missionary. Pope Francis reminded us that he wanted to be named after the poor man of Assisi, Saint Francis of Assisi. Right off the beginning, we thought there's something touching, there's something tender, there's something different about this man, Jorge Bergoglio, when he went into what we call the Room of Tears to be vested. It's right off the Sistine Chapel and there are three cassocks in there. There was a small, medium and large. When I didn't see an XXL, I knew I didn't have a chance anyway. When he came back out, the protocol was for all of us to line up and go up and pay our allegiance to him. He kind of stood in line to begin, and then all of a sudden we saw him dart through the Sistine Chapel. We thought, "I wonder where he's going?" There was one cardinal in a wheelchair and one cardinal on a walker, and he immediately went down to them. Now, folks, that's very ordinary, isn't it? That's simple raw courtesy, but I don't have to tell you all that there's nothing ordinary about simple courtesy anymore, and here is a man that has this spontaneously. As we began to go up, of course, the attendants by then were coming in and there was conversation going on. We were asking the attendants as they came in if there were people out in the square waiting. The word went around that it was raining. You can see the Pope, he perked up and he looked out at us and he said, "Look, we're going to have dinner together. I can meet you later. I don't want to keep those people waiting out in the square in the rain." Just a simple, ordinary, daily, touching gesture, but it gets to the heart of the man. This is the pope who is restoring the heart of the Church. This is the pope who's making "charity" a household word, as John Paul made "solidarity" a household word. This is the heart that breaks the tragedy. This is the heart that, like Jesus, goes out to those at the side of the road, urging all of us to get out of the sacristy, to cast out to the deep. This is the heart that tells us to be with our sheep, to smell like the sheep. This is the heart that encourages us to take risks and dare and not even be afraid of accidents. This is the heart that has a particular radar for the poor. I'm often reminded when I look at Francis of the ancient story about Saint Lawrence, one of the great saints of Rome. When Caesar, the Emperor of Rome, called him in and said, "I want all the treasures, all the riches of the Church in this courtyard within three days or I will unleash a persecution," Lawrence came back three days later and the attendants went to the Emperor and said, "Lawrence is here." And the Emperor said, "Are there riches? Are there treasures of the Church with him?" They said, "He's brought them." When the Emperor went out, he sees the beggar and he sees the blind and he sees the widow and he sees the orphan, hundreds, thousands of them, and Lawrence said, "This, this is the treasure. These are the riches of the Church." This is the heart that is not afraid to be tender. Will you ever forget his installation sermon on the Feast of Saint Joseph, March 19, last year? Right afterwards, I can remember, at the end of it — it was very brief; another reason I like him, because he speaks very briefly — I was sitting next to one of the more brilliant men in the College of Cardinals, the Archbishop of Vienna, Christoph Cardinal SchÃ¶nborn, who wrote the Catechism — a great intellectual. He turned to me and he had tears in his eyes, and he said, "Tim, this man speaks like Jesus." I said, "Chris, I think that's the job description." Do you remember what he said? Afterwards, I had an interview with a very renowned woman journalist. She spoke to me privately as a pastor. She said to me, "Cardinal Dolan, I'm extraordinarily moved. I just had to cover this installation Mass. In my job, I'm at wars, I'm at famines, I'm at plagues. I see violence and drugs and crimes. I see humanity at its worst. That's my beat. This man, this man speaks about tenderness." This man spoke about Joseph holding the baby Jesus and embracing his virgin wife. This man says we shouldn't be afraid to be tender with God, tender with ourselves and tender with one another. This is a man who knows what Bernini's colonnades are all about, those colonnades that reach out around St. Peter's Square and of which Bernini said, "These are the arms of Holy Mother Church that want to bring all the people closer to Jesus in and through the Church." This is the man with a heart who tells us that the Church is not some NGO, it's not some cold, clinical institution, it's not just some other organization with an agenda, it's not just an ethical society. This is the Church that is really a person, Jesus Christ, who has a heart that we call the Sacred Heart. This is the Church that is a family, that has the heart of a family, which is the Sacred Heart of Christ. To restore the heart, to restore the tenderness, to restore the luster of the Church, perhaps, will be the driving mission statement of Pope Francis, because we live in a culture that believes that Christ is fine but the Church, forget about it. We'll take God as our Father, as long as we're the only child. We'll take Christ as our shepherd, as long as we're the only sheep in the flock. We'll claim Jesus as our general, as long as it's a one-man army. We want Christ without the Church, and Francis reminds us over and over again that you can't have one without the other, that Jesus Christ and His Church are one, and that we're part of a family. We're born into it. The Church is our mother. The Church is our family. We've got God as our Father. We've got Jesus as our Lord and Saviour, yes, but as our older brother. We've got Mary as our Mother. We've got the saints as our brothers and sisters in what we call the communion of saints. Even on Earth, we have a man we call our Holy Father. We have the sacraments that bring us together as a family. This family, by the way, can be dysfunctional because this Church is always in need of reform, but with Saint Peter and with Saint Francis, while recognizing that the mystical body of Christ has tumours on it, while recognizing that the family of the Church is dysfunctional, this is a Church about which we say what Peter said about Jesus, "Lord, to whom else shall we go? You and you alone have the words of everlasting life." A pope with a heart. Now, students, learn about the heart of Francis and learn how genuine and authentic it is. You see, I'm trying, like you are after a year, to think, what is it about Francis that has so magnetized the world? What about his popularity? My Lord, did you ever think that the Pope would be on the cover of Rolling Stone? That's like me being on the cover of Men's Health. It just seems impossible. What is it that has touched this nerve? What is it that has touched this heart? I would propose to you it's his heart, which is genuine and authentic. There's nothing staged. There's no marketing here. There's no strategy here. The world thinks there is. Archbishop O'Brien, Archbishop Prendergast, and perhaps Father Ray can all agree with me. When you meet with journalists, they think there is a strategy and marketing. There's no marketing there, there's no strategy. It comes from within. It is authentic. It is genuine. His faith is not spray-painted on. It's something that comes from deep within. It comes from his faith, which is the theological virtue implanted in the heart and soul of the believer like you and me on the day of our Baptism. This is about as deep down as you can get. This is as authentic and genuine as you can get. This is no frills, this is no artificiality, this is no staging, this is no strategy. This is Francis, this is the heart, and this is the charity that this great pope can teach us. Now, final word, everybody. Every pope has these. John Paul had a heart in abundance. Benedict had a soul. A soul, head and heart, clarity, courage and charity, all the popes have got them. These three that we're most familiar with had them in spades. We never praise a given pope at the expense of another, which is the temptation today in praising Pope Francis. Sometimes it seems non-Catholics have a higher estimation and a deeper esteem and appreciation for the gift of the papacy than we do. We Catholics believe they are a gift. The world recognizes them more than we do. Remember George Bernard Shaw in his preface to Saint Joan. Do you remember what he wrote? "Compared to our infallible democracies, our infallible doctors, our infallible scholars and scientists, our infallible judges and our infallible lawyers and our infallible governments, the pope is on his knees in the dirt, confessing his ignorance before the throne of God, and in the end has more right to the claim than all the others combined." My brother Pat, my youngest brother, who was there in the square, and I saw the interview that he gave. I'm so proud of my brother. I didn't see it until a couple of days later. There's Patrick and he's being interviewed. First of all, Patrick is 46, and he says, "I'm the oldest guy in the square," because hundreds of thousands there were young people. He said, "You know, the greatest cheer went up when the white smoke went up, and it dawned on me. I'm looking around at these people, ecstatic at the white smoke. We didn't know who the new pope was. We didn't know where he came from. We didn't know what languages he spoke. We didn't know if he was called liberal or conservative. We didn't know how old he was. We didn't know what name he was going to choose. We didn't care, because all we knew was that we have a pope, and that's what causes us to cheer." 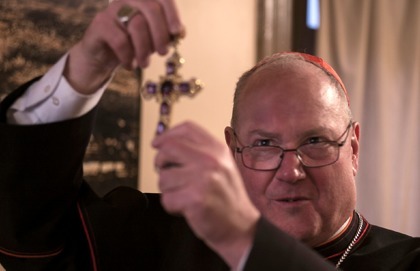 His Eminence, Timothy Cardinal Dolan was named Archbishop of New York by Pope Benedict XVI on February 23, 2009.